This isn't the story of a major redevelopment. There is no slash and burn, or giant digging session, no major transformation from paddock into box hedge and standard olives. 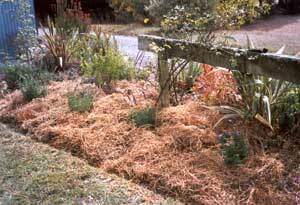 Sometimes a garden project is small and gentle, so subtle that uninformed relatives may not even notice. Sometimes the most successful projects begin and end on the same day, with instant improvement. Such a project is my inspired remodelling of the Stables Border. The Stables Border has had moments of success. 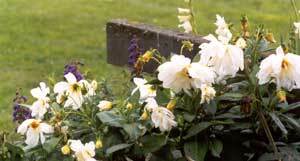 Dahlias have flourished here in late summers, while Catmint and bright pink Penstemons have given colour earlier. Lychnis has happily self seeded to fill the gaps. The Leucadendron Safari Sunset seems to enjoy it here in all seasons, and late spring roses (Bantry Bay and Windrush) have climbed happily (and stylishly) over the old horse hitching rail. But the reality is that the Stables Border has never been irrigated. And finally this summer I have become totally fed up with shifting dribbly hoses and bucketing water in from the race. This border has been living on the edge far too long. The grass surrounding it is dry and pale brown. The plantings, like the surrounding lawn, are far too scruffy. 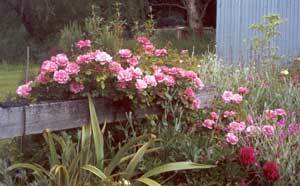 I've moved the little flower carpet roses out, given them a winter prune and stuffed them into plastic pots. The penstemons are history - I've taken cuttings - the scruffy hebe and the cistus are gone, and so has my attempt at left field elegance - goodbye, bronze fennel. The weedy looking chrome Euphorbia seedlings which I thought I liked have been removed. One parent plant remains, planned to echo the yellows in the spring bulbs already planted. The self seeded Lychnis have all been ripped out. Too scruffy, even in flower. I've moved in a swathe of blue irises and planted a spine of English lavenders. 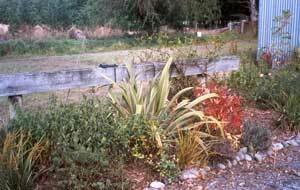 The driveway side retains its daylilies and gains some reddish brown tussocks. With the silly wilting perennials gone the three resident coloured flaxes now bind the different foliage colours together. Their form looks stronger, their colours seem more interesting. This is the quickest new project I've ever attempted. Now I have to wait and see if the new Stables Border works.